Its lazy Sunday and Sunny Day. My mind started crunching for quick breakfast ideas. As its fall season here in North America, I craved for something warm and sweet to dig into, but not too sweet and definitely not my usual peanut butter or strawberry jelly sandwiches. When I saw ripe bananas sitting on my counter the light flashes in my brain immediately. Yes, it said Banana pancakes is perfect for today’s morning. Healthify it–> Whole Wheat. 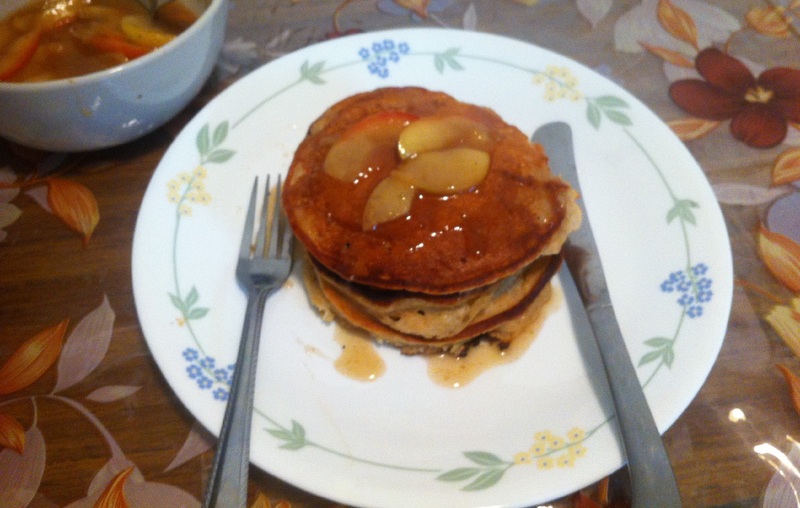 But, there is no maple syrup or honey to go with it today…again the light flashes..its Sauteed Apple. The whole thing got whipped up in just 30 mins. Pancakes are mainly made with whole wheat flour, ripe banana, yogurt, milk , egg and flavored with vanilla essence and cinnamon . I added chopped walnuts for myself and hubby. My girl got an extra love dose with chocolate chips and chocolate syrup to go with it. She gobbled it up asking for more chocolate syrup for every few bites. I sifted the dry ingredients in a large bowl and blended the wet ingredients in the blender quickly and added them both with a light hand. 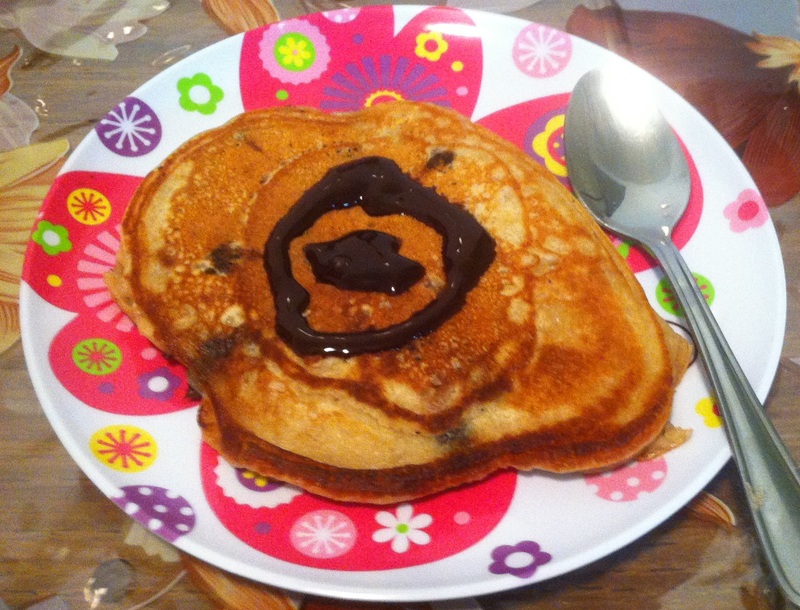 Take care not to over mix them, as there are chances of dense and hard pancakes. Nuts add nice crunch to the pancake and along with stir fried apple. Sautéed Apple is usually made my stir frying apple in butter and adding lot of sugar. Here we fry them with a little olive oil(extra light) and add only teaspoon or two sugar. These Pancakes are fluffy, moist and flavorful. Sautéed Apple gives nice crunch, sweetness and tartness to the whole dish. Pancakes freezes easily to 2 months. Thaw it in refrigerator the night before and pop it into oven at 350°F or toast it in toaster just like bread slices.